First a correction to my last post – I’ve since realized that Balinese Hindu offerings are made indoors as well, but since most places are open air, I always feel like I’m outside and I do still believe that most religious activity takes place outdoors. Still, for those of you fact checkers out there, I stand corrected. Now, I cannot wait to share my first impressions of the Gili Islands, but I can’t help but point out a widely accepted behavior in Bali that I just can’t wrap my head around: babies on motorcycles. I think I even mentioned this phenomenon in an earlier post but that just goes to show you how continuously awestruck I am by it. Maybe it’s affecting me more so now that I’ve been here for 5 days and I’m starting to miss my own family, but I took the pictures below amidst the crazy traffic we encountered on the way from Candidasa to Padangbai where I boarded my boat for the Gilis. This is perfectly normal behavior here – in fact, these little girls are old compared to many of the infants I’ve seen wrapped in their mothers arms on the backs of these weapons. When I told my driver this was crazy to me, he simply asked, “you no do this in America?” No sir, we do not. I told him he’d be thrown in jail for that in the States but he pretty much ignored me and went back to drumming out his techno beats on the steering wheel. Did I mention he has a 3-year old? 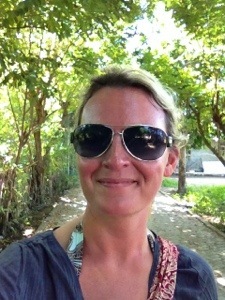 Okay so moving onto the Gilis…wow. 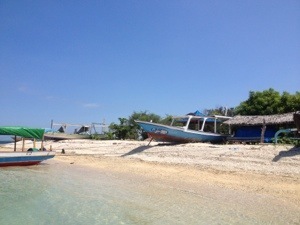 The Gili Islands are three tiny islands off of the coast of Lombok, Bali’s large neighboring island. 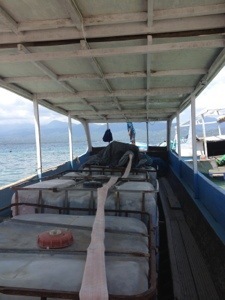 It takes about an hour to get to them via fast boat and about 4-5 hours via ferry. I am here because they are very well known for their dive schools and sites. 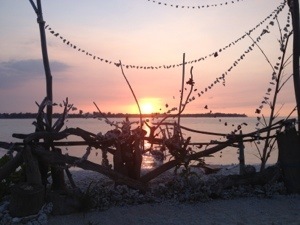 The three islands are Gili Trawangan, Gili Air and Gili Meno in order of largest and most populated to smallest and least commercialized. 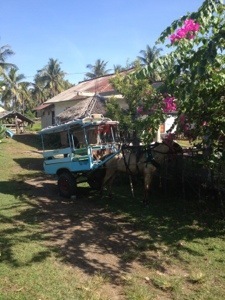 While motorized traffic is not allowed on any of the three (they use little pony-drawn carriages and bicycles instead), Gili T as it’s referred to has exploded in recent years and is similar to Bali’s Kuta with the techno/eletronica scene that appeals to a lot of Australian spring breakers and party-goers. 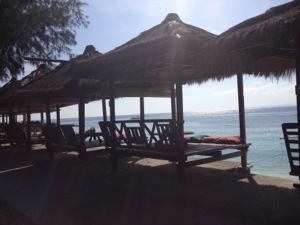 I, on the other hand, am staying at a lovely beachfront villa on Gili Meno which I had to get to by being dropped off at Gili Air and then hiring a random fishing boat to scoot me over to the tiniest Gili. 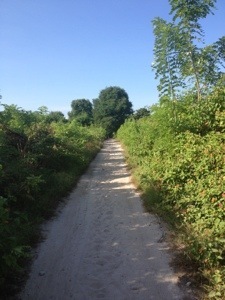 You can walk the entire perimeter of Gili Meno in less than 2 hours. 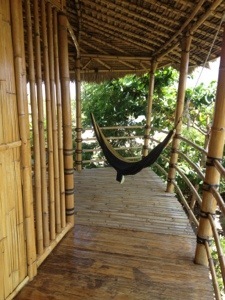 This is truly paradise if your idea of paradise includes hammocks in treehouses, $8 oceanfront massages, fresh and delicious flavors everywhere you turn, open air showering and sleeping, hot pink sunsets and apparently some of the best snorkeling in the world. I haven’t yet strapped on the mask and fins yet, but a lovely Norwegian couple I met last night said they swam with a sea turtle just 50 feet offshore from my villa yesterday. The place I am staying at is called the Sunset Gecko (of course it is, though no sign of Hansjergen’s distant cousins yet) and I feel like I’m at home. Pedros and Iwan are running the show around here, including a lovely restaurant with an extensive menu, and they couldn’t be sweeter. They call me Miss Marissa and make me feel as though I’ve been living here for years, accomodating my slightest request. 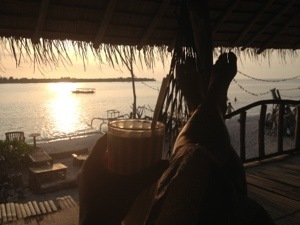 This morning I will explore the island for a bit before heading out on day 1 of my open water dive course. You look great sister! Thank you for sharing your journey with us. 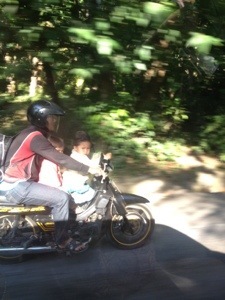 Do u find it odd that the driver has on a helmet but not the kids. I wonder is he more concerned about himself than his children or do they just not have access to kids size helmets and even if they did I wonder if they could afford them. Love u!